In a random hallway inside the KFC headquarters, inside their legal department, across from a copy machine, next to a shelf that stores three stacks of paper and possibly the saddest Keurig machine in existence is... a broom closet. Or well, that's what it looks like. 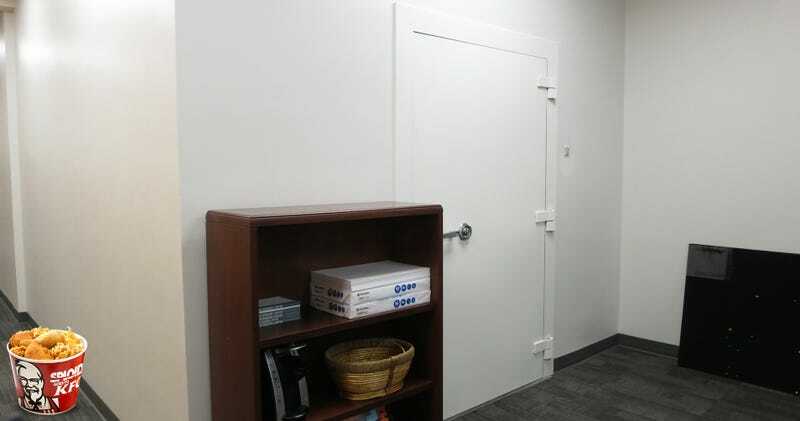 It's actually the vault that hides KFC's biggest secret: the Colonel's Original Recipe. KFC goes to extreme measures to keep the original recipe a secret (and to exploit the mystery for a big capital-M marketing ploy). Only one person in the world knows the combination for the safe and only two people know which 11 herbs and spices actually go into the Colonel's secret recipe and how much of each. In fact, KFC purposely uses two different companies to make the recipe for them, one company does one part, the other company does the other and then a "computer processing system" blends it together. So secretive! And yet they couldn't even put a poster of, I don't know, The Colonel on the wall or something. Or make it out of steel like a bank vault. Or at least, plug in the Keurig. Nope, the vault stays sad. For what it's worth, the safe is more intimidating than it looks. The security is layered like an onion. The sad, empty exterior hides thick cement walls, another safe and probably more security measures that might include lasers, sharks and or laser sharks. But still, dress it up a little! Have some fun! Hide it in a giant bucket of chicken. Or guard it with a thousand Colonel Sanders in Terra Cotta form. Basically anything but that blank wall. From Fort Knox to the set of Office Space.